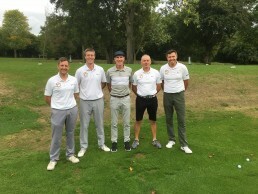 Our County Scratch League team have had an eventful season this year. It started seeing them being quickly promoted back to the First Division for 2018 after one season in Division 2 last year. Having probably one of the smaller pool of players to call upon they did themselves credit and against tough competition versus six other local Clubs; we saw them win three and lose three of their six fixtures. The final Div 1 table (below), saw them in equal 5th place, just one point from safety. With two teams to be sent back to Division 2 their season finished with a tense home and away play off against Breadsall Priory. The picture above shows the team for the second leg of the playoff which took place on 15th September. It comprised Dan Bennett, Adam Glew, Gary Griffiths, Stu Walters and Captain Lee Morgan. Although the playoff eventually ended in a win for Breadsall, we are all proud of our teams efforts this season. Further mentions should also go to others who played for the team through the year; John Baugh, Alwyn Brooks, Chris Brooks, Mark Brooks and Trev Pearson. Good luck for the 2019 season and here’s hoping another swift return to the ‘top flight’.